Clark Seif Clark (CSC) provides air quality testing and monitoring services to protect demolition workers and residents from potential airborne hazards. At CSC, our air quality professionals can help prevent exposure concerns during these types of projects by utilizing air testing and monitoring equipment. Last month, The Desert Sun published a report about the demolition of a 229 room hotel and spa in downtown Palm Springs. The article stated that the building, constructed in the 1960s, was found to contain asbestos during the demolition project. Due to this find, containment of the worksite and air monitoring was put into place to prevent exposure to any asbestos fibers released into the air. Each year, countless homes and buildings that have outgrown their useful lives are slated for demolition. These demolition projects result in millions of tons waste and ruble. While much of this waste is inert or nonhazardous, other debris may contain hazardous materials that may be regulated by the state and/or federal government. This waste and the demolition process itself, can in some circumstances, create exposure concerns for the workers involved in the projects and even nearby residents. 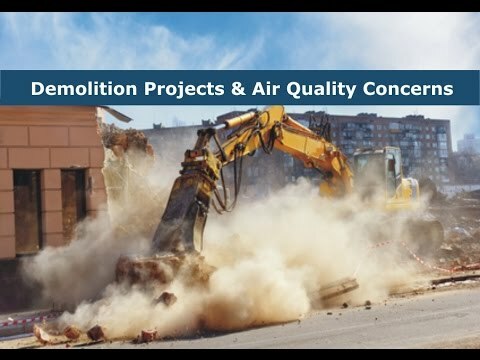 There is typically a large amount of debris and particulate matter that can become airborne during demolition projects and spread to surrounding properties. Depending on the type and age of the building, it could contain any number of potentially hazardous materials. These may include asbestos, lead, mold, polychlorinated biphenyl (PCBs), mercury and other substances. To learn more about air quality testing and monitoring services or other environmental, health and safety issues, please visit www.csceng.com, email csc@csceng.com or call (800) 807-1118.